We’d love your help. Let us know what’s wrong with this preview of The Julian Chapter by R.J. Palacio. Over 1 million people have read Wonder and have fallen in love with Auggie Pullman, an ordinary boy with an extraordinary face. Now readers will have a chance to hear from the book's most controversial character—Julian. From the very first day Auggie and Julian met in the pages of the #1 New York Times bestseller Wonder, it was clear they were never going to be friends, wi Over 1 million people have read Wonder and have fallen in love with Auggie Pullman, an ordinary boy with an extraordinary face. Now readers will have a chance to hear from the book's most controversial character—Julian. From the very first day Auggie and Julian met in the pages of the #1 New York Times bestseller Wonder, it was clear they were never going to be friends, with Julian treating Auggie like he had the plague. And while Wonder told Auggie's story through six different viewpoints, Julian's perspective was never shared. Readers could only guess what he was thinking. To ask other readers questions about The Julian Chapter, please sign up. Should I read this book? I've read Wonder a couple times now, but I was wondering (haha) if I should buy this one as well. Paul Alex Prince, III Had it been the final chapter of the original novel, it would have been my favorite chapter of all. Definitely worth purchasing. is it as good as the original wonder? Emu Yes, it pretty much is. It gives the perspectives of Julian, Auggie's old friend Christopher, and Charlotte. I absolutely loved 'Wonder' and think that everyone should read/listen to it at least once. However, with all of the different viewpoints offered, I felt like one of the most important POVs had been skipped. As much as I detested Julian in 'Wonder', I really wanted to know exactly what made him such a mean kid. How does a child learn to behave so hatefully? Apparently, I wasn't the only person that felt that Julian's POV was needed. Immediately upon finishing 'Wonder', I went in search of Julian' I absolutely loved 'Wonder' and think that everyone should read/listen to it at least once. However, with all of the different viewpoints offered, I felt like one of the most important POVs had been skipped. As much as I detested Julian in 'Wonder', I really wanted to know exactly what made him such a mean kid. How does a child learn to behave so hatefully? Apparently, I wasn't the only person that felt that Julian's POV was needed. Immediately upon finishing 'Wonder', I went in search of Julian's POV and I lucked out. The author wrote a separate short story to tell Julian's side of the story. Of course, I dived right into Julian's story right away and it proved to be a great decision. I have to admit that as much as I wanted to hear Julian's side of events and learn about what motivated him, I was a bit hesitant. Julian was a character that made me feel anger and rage at his actions. I had to keep reminding myself while reading 'Wonder' that he was just a child and that he probably didn't fully grasp the impact of his words. Starting this book, I was worried that I wouldn't find any redeeming qualities in Julian and that I would spend hours being upset by his callous behavior. Thankfully, my fears were unwarranted. 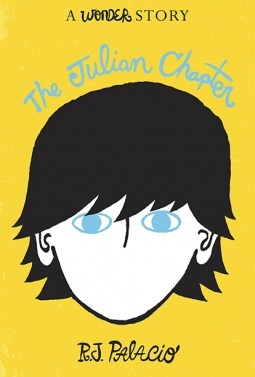 'The Julian Chapter: A Wonder Story' takes place toward the end of the school year and the following summer. It begins when Julian is caught leaving mean notes for Auggie and Jack in their lockers. The Principal and school counselor are tipped off and are able to intervene, finding an especially cruel note before Auggie does. While Julian's actions were inexcusable, his family dynamics spoke volumes. I was immediately taken aback by his parents lack of concern for his behavior and their obsession with public image. It was clear to me that this is where Julian's troubles really started. As a parent, I was appalled by these shallow individuals. Julian's mother even went so far as to photo-shop Auggie out of the class photo! I just have no words. Initially, Julian is defensive and doesn't really grasp the severity of his actions. However, as the story progresses - and with no help from his parents - he comes to see the error of his ways. His grandmother, whom he spends his summer vacation with in France, is instrumental in this. Julian's grandmother tells him about a boy that she knew when she was younger. He was disabled and often treated cruelly by the children in the village because they were afraid of him. As a young Jewish girl, hunted by the Nazis, it was this boy that ended up saving her life. Despite the mistreatment that he had endured, he showed kindness and bravery. He risked his own life to save a girl that had never paid him much attention, except to avoid him. After hearing his grandmother's story, Julian is able to connect the empathize with Auggie. Finally, he feels genuine remorse for his actions and understands exactly what he did. It was like he turned a new leaf and I really liked this new Julian. I'm very glad that I read Julian's story. I was worried about what I would get when I started it, but it did not disappoint. I especially liked Julian's grandmother. She provided the guidance and wisdom that Julian's parents failed to. On the flip side, I could not so easily forgive Julian's parents. Yes, they too came around a bit at the end, but only with the grandmother twisting their arms. Some explanations were offered for Julian's mother's behavior, but I found them to be weak at best. Julian may have been a child, but his parents were not. They should've known better. I just couldn't get past that. Overall, this was a fantastic story. He isn't an easy character to like, but this book serves as a reminder that even bullies are human. Despite his despicable behavior toward Auggie, Julian was only a child in need of some direction and positive role models. In the end, he becomes a better person. If you enjoyed 'Wonder', I would definitely recommend this one. One mistake does not define you. I didn't expect to like this story as much as I did. Mostly because I hated Julian in Wonder. But this story actually made me like the kid a bit more (I still don't quite like him, but I don't hate him either, so that's something). It was nice to see him developing and growing as a character. I really hope that the other two stories are as good as this one, because I'm not ready to say goodbye to these really wonderful characters. A fresh start gives us the chance to reflect on the past, weigh the things we’ve done, and apply what we’ve learned from those things to the future. If we don’t examine the past, we don’t learn from it. I was hesitant to read this because I know that Julian is such a jerk and a total douchebag, but the apple doesn't fall far from the tree. Just look at the reaction of his mother seeing Auggie for the first time — in their middle school class picture! Seriously, Photoshop? Ugh. I read Wonder about two years ago, so when I found out that there were short stories that went with the book I had to read them. I was very impressed by the Julian chapter. I didn't think it would be as good as it was. I loved the story his grandmother shared and how it connected to him so well. It was such an emotional story. Julian, the bully as we've known him from Wonder, got a chance to tell his side of the story - why he was so mean to Auggie, what happened during the summer and how he righted the wrong. I loved the story Julian's grandmother told about the boy in her class when she was a little girl. That part of the book got me weep. It was just so beautiful. Una historia muy corta y muy fácil de leer, con una enseñanza maravillosa "Se vale cometer errores" y además llena de frases preciosas. Como imagino que era la intención de la autora, cambió toda mi concepción sobre Julian, sin justificar si comportamiento lo comprendí, y sentí empatía por su historia. "It is always brave to be kind." When August starts the fifth grade at Beecher Prep, he takes everyone by surprise. Not having a conventional apperance, he causes quite the uproar particularly with Julian. Julian is a popular kid in the grade and takes an instant dislike to August. Thus, Julian begins to make Auggie's life at school difficult. This is his side of the story. I read 'Wonder' a little while back but the impact it left me with has not yet dissipated. Julian is the bully and I'd be ly "It is always brave to be kind." Siempre hay que conocer el otro lado de la moneda. La historia de Julian aunque no es tan buena como la Lección de August (la historia de Grandmére fue el mejor bonus), se permite ver su POV, se puede ver su evolución. Es sin duda una gran historia de superación personal. Me gusto mucho la segunda mitad, de nuevo R.J. Palacio hace que tengas todas las emociones al máximo, me encanto la narración, me reí por muchas frases y comentarios que hacia Julian hacia sus padres. También morí que podemos ve Siempre hay que conocer el otro lado de la moneda. Me gusto mucho la segunda mitad, de nuevo R.J. Palacio hace que tengas todas las emociones al máximo, me encanto la narración, me reí por muchas frases y comentarios que hacia Julian hacia sus padres. También morí que podemos ver que sucede un poco después del final de La Lección de August, lo cual agradecí. La parte mala obviamente son la odiosa madre de Julian y su padre no canta mal las rancheras. Creo que gran parte del problema de Julian se debía a ellos. This is an additional chapter of Wonder from Julian's POV. I didn't like Julian, he was so annoying and couldn't understand Auggie's condition at all. But I liked his grandma and her story so much, they were so similar,though! In this book, you learn that nothing seems like it is used to be, and never to judge anyone unless you know him well. Una historia corta pero muy fuerte, aquí pudimos comprender la manera de pensar de este niño y así pudimos enterarnos del porque de sus reacciones y actos, que aunque no se justifican si se entienden. La historia de la abuela fue muy enternecedora y le agregó mucha fuerza. Los elementos y personajes nuevos fueron muy pero muy gratos, las emociones se sienten y lo que Julian aprendió al final es algo muy bonito de leer. Ojalá hubiera más historias como estas. 5 stars does not do this short story justice. I was moved to tears as I read Julian's story (the bully in Wonder). It's not often that you get to peek into the mind of a bully & their struggles. This story is a must read for not only school age children but adults too. So much to learn!! I didn't like this book as much as the "Wonder" book itself. I wonder if the writer only wrote this chapter because readers all over the world were asking for it. I don't think a writer can write what people want, and get away with it. A writer should write what they want, and the right people will love it. First of all I don't find the Julian character believable. The way he talk and act is so different from what he does in "Wonder". Like a different person. I also find the whole nightmare situatio I didn't like this book as much as the "Wonder" book itself. I also find the whole nightmare situation weird. He is 10! The grandmother story seems like it was just put in there, because there had to be a reason why Julian is a bully in book 1. And it had to be a "awww, poor boy!" reason. Stuff with grandmothers, world war 2 and the holicaust always work. Or so they used too, before every writer began throwing a part in their book about it. I don't feel we as readers necessarily needed a Julian chapter. I don't think it's a bad thing to leave your reader wondering and reflecting a bit. And because the Julian chapter was not living up to the standard of "Wonder" I would rather have been without. However the flow of words, and the writing style is still really good, - therefor 3 stars. A great short story written in Julian's perspective. The Grandmother's part almost made me cry. 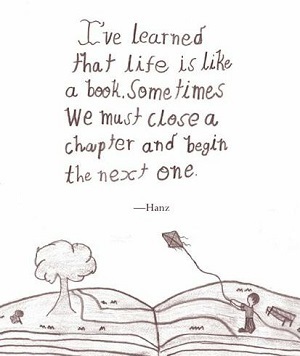 "Sometimes it's good to start over." Must be read after 'Wonder' to fully experience the depth and wisdom of this seemingly simple and touching tale. He looked at us and took a deep breath. "Oh boy, I think I've just made you all more nervous, haven't I?" We shook our heads. He rubbed his forehead. "You know," he said, "one of the things you learn when you get old like me is that sometimes, a new situation will come along, and you'll have no idea what to do. There's no rule book that tells you how to act in every given situation in life, you know? So what I always say is that it's always better to err on the side of kindness. That's the secret. If you don't know what to do, just be kind. You can't go wrong." "But the good thing about life, Julian," she continued, "is that we can fix our mistakes sometimes. We learn from them. We get better. I never made a mistake like the one I made with [him] again, not with anyone in my life. And I have had a very, very long life. You will learn from your mistake, too. You must promise yourself that you will never behave like that with anyone else again. One mistake does not define you, Julian. Do you understand me? You must simply act better next time." I nodded, but I still cried for a long, long time after that. And in my dream, I think I saved him. But what was really interesting to me, when I thought about it, is that it had been a dream - not a nightmare. And in the dream, Auggie and I were on the same side. Renégade ♥ JV ❄☃❄ wrote: "Lovely review, dear Renegade! I love Gran here, but Julian is still a bully! 😋"
Wasn't Gran lovely and wise? And (view spoiler)[I comple JV ❄️☃️❄️ wrote: "Lovely review, dear Renegade! I love Gran here, but Julian is still a bully! 😋"
And (view spoiler)[I completely understand why you feel as you do and that not all readers will be ready and/or willing to forgive Julian for how cruelly he behaved in Wonder. As Gran points out, the forgiveness of others for the harm we do to them is not in our hands and is ultimately their choice. They do not owe us that. What is in our hands is the decision to learn from our mistakes, to not make them again, and to DO BETTER. My take was that Julian finally understood and experienced genuine remorse. He finally took responsibility for his choices and for behaving as a bully. He couldn't take back or change what he'd done, but he did what he could to acknowledge the harm he'd caused another human being who'd done absolutely nothing to deserve it. We both know that so many never do. So I like to think that Julian took Gran's powerful and moving tale, as well as her message of personal responsibility and making better choices, to heart. And that there is hope yet for young Julian going forward. "There's a whole big world out there, and not everyone is nice to everyone else. Thats just the way it is." Let me just start off by saying that Wonder has been one of my absolute favourite books this year and I was so glad to jump back into Auggie's world through the visions of Julian, his bully. I loved The Julian Chapter. It was perfect. Having the perspective of the bully opened my eyes and allowed me to empathise with his side of the story. Remember guys, there's always two sides to a story. "There's a whole big world out there, and not everyone is nice to everyone else. Thats just the way it is." It was perfect. Having the perspective of the bully opened my eyes and allowed me to empathise with his side of the story. Remember guys, there's always two sides to a story. Never just one. Julian's anxiety issues with his nightmares made sense as to why he treated the way he did with Auggie. But still, that's no excuse to mistreat someone just because they're different. Emotional pain is always more painful than physical pain. We're all different. Acceptance and mutual respect between one another is important. R.J Palacio is amazing and her work has yet to disappoint me. Her writing is simple and the way she modifies her work to the age of her characters simply amazes me. Glad to have picked up this novel. The Julian Chapter does open up more avenues for Wonder. The best part of the book was when Julian's Grandma shared about her past with him. Everything clicked for him and he understood his mistakes. I had to read his Grandma's story literally twice at a go! It was that good, trust me on that! "Sé amable, pues toda persona con quien te encuentras está librando una batalla." Me encantó el detalle de la historia de Tourteau. If you did read Wonder , one of the most controversial character of the book was Julian, the bully. His story needed a bit more space than a single chapter, that's why R.J Palacio decided to write this short-story on the main antagonist of the book. Julian didn't help making Auggie Pullman's school life any easier since he got into his school. He hates him, he treats him like he has the plague, but why does he do it? He is just an horrendous kid or is there something more behind it? The writer pu If you did read Wonder , one of the most controversial character of the book was Julian, the bully. His story needed a bit more space than a single chapter, that's why R.J Palacio decided to write this short-story on the main antagonist of the book. The writer put us in the position of seeing the world with the bully's eyes, a peculiar perspective we are not always used for. I did appreciate her effort, but I wasn't able to understand or relate with Julian in any way. I simply didn't like him and couldn't justify his actions and even less his parents, whom I hated to the core.Given the incompetent parents his only chance of redemptions comes from the grandma, who with a moving story, makes him understand his mistakes. It was interesting reading his perspective but even if the writer intended to redeem him she did it in the classic fairytale like way, where everything is changes in a blink of an eye. I hope it will be more interesting to read about the other to characters: Christopher and Charlotte. I still think this books have a perfect educational purpose, they should recommend this reading in every school. Julian's voice was missing from Wonder, an absence that I felt. This additional short completes the story for me. I wanted to strangle Julian and his parents at times, but I feel he explains and redeems himself in the end. I'd love to see this included in future editions of the main book and hope that teachers who have their students read the novel will also have them read the bully's perspective. Es curioso que esta historia me gustara más que la de August en sí, jajaja. Es genial cómo la autora hace que cambiemos de punto de vista y veamos todo desde la perspectiva de Julian, el chico que le hacía "bullying" a August en el colegio. Julian es el chico que, aparentemente, odia a August por su apariencia física, porque empieza a acaparar toda la atención que antes tenía él, que era el popular del colegio y... en fin. En este libro entendemos por qué actúa como actúa Julian; conocemos a sus Es curioso que esta historia me gustara más que la de August en sí, jajaja. En este libro entendemos por qué actúa como actúa Julian; conocemos a sus padres, que son un par de capullos egocéntricos y que creen que todo lo puede arreglar el dinero y el buen nombre; conocemos a su abuela, que es una mujer que vive en París y que es absolutamente geniaaaal; y, por supuesto, conocemos al verdadero Julian, que no es más que un chico de 10 años que ha cometido algunos errores. Si el libro anterior nos enseñó a no juzgar a las personas por su apariencia física y a ser amables sin importar por qué, este libro nos enseña que hay más que lo que vemos a simple vista. Sí, Julian es un niño rico que pasa todas sus vacaciones en París, pero es un niño asustado, que reacciona mal para protegerse del qué dirán, que tiene problemas de ansiedad y... bueno ¡que tiene 10 años! Todos hacemos tonterías cuando somos pequeños... e incluso cuando somos mayores. Great to see the world from the bad guy's point of view. I received an advance reader edition of this book from Random House Children's Publishing and Net Galley for the purpose of providing an honest review. I was one of the many people who fell completely in love with the book Wonder, which told the story of a boy who was born with a facial deformity. I fell in love with Auggie as I devoured Wonder in one sitting. In that book, Julian was the bully at the school that made things difficult for Auggie. When I saw that Julian's story was being released, I jumped at the opportunity to read it. This work is short, approximately 84 pages, and can easily be read in a single sitting. The entire story is told from Julian's point of view. The first part of the story goes over some of the events that happen in Wonder. After reading Julian's point of view, I can understand why he acted as he did towards Auggie. There were times that I found myself feeling badly for Julian because of the lessons he was being taught by his family. Julian finds himself spending time with his grandmother in France in the second part of the book. He tells his grandmother the events that had happened during the school year. After hearing what Julian tells her, she tells Julian her own story which is the most powerful part of this piece. His grandmother's story helps Julian and his family see the events concerning Auggie differently. While I was not convinced that his parents turn around was permanent, Julian's remorse seemed authentic. When I read Wonder, I got the impression that Julian was a spoiled kid. I thought his mother was unsympathetic and I was relieved when the middle-school director hinted that he wouldn’t be coming back in the fall. In The Julian Chapter, we got to see everything from Julian’s perspective. While his parents were supportive, I wouldn’t say they exactly understood what their child was struggling with. I got that Julian’s mom was trying her best to protect her son. I could understand why she wanted Julian to be happy but the approach she used was just awful – she was making things worse for everybody. After reading The Julian Chapter, I felt relieved to say that Julian wasn’t a bad kid. He could sound mean and cruel at times but he wasn’t heartless. It was good to see him making some amends in the end and I liked that he learned to own up to his mistakes. What I didn’t expect was the amount of tears rolling down my face while reading the story. I guess I was being caught off guard as I never suspected I’d become emotional as I got to know Julian and his family. It’s wonderful to see the growth in Julian and the story helped me see why we could never run away from our fear. I was so happy to finally hear Julian's voice. I loved Wonder, and this is a must-read for fans of that book. I will say that I didn't entirely buy Julian's reasons for being the way he was being (I thought he just enjoyed his power and influence in the school and enjoyed exercising it...period), I appreciated finally hearing his voice. I thought the author did a nice job of letting us hear Julian's chapter, while subtly reminding us that there was no excuse for his behavior. I was pleasantly su I was so happy to finally hear Julian's voice. I loved Wonder, and this is a must-read for fans of that book. I will say that I didn't entirely buy Julian's reasons for being the way he was being (I thought he just enjoyed his power and influence in the school and enjoyed exercising it...period), I appreciated finally hearing his voice. I thought the author did a nice job of letting us hear Julian's chapter, while subtly reminding us that there was no excuse for his behavior. I was pleasantly surprised to meet Julian's grandmother in this book, and thought she added a very satisfying voice of reason to this family. I hope this isn't the last we'll hear from the children of Beecher Prep. I'm not a big fan of novellas in the series, especially from different point of view, of each character. But Wonder is simply a wonder, a great story, so I really enjoyed reading. Granny's story was wonderful! Reseña en mi blog: La cueva de Danny. It's good to star over. A fresh star gives us the chance to reflect on the paste, weigh the things we've done and apply what we've learned from those things to the future. If we don't examine the past. We don't learn from it. Creo que eso es en lo que consiste el libro, uno comete errores, pero lo importante es aprender de ellos. Si creo que el libro esta de más y que perfectamente pudo es Reseña en mi blog: La cueva de Danny. R.J. Palacio lives in NYC with her husband, two sons, and two dogs. For more than twenty years, she was an art director and graphic designer, designing book jackets for other people while waiting for the perfect time in her life to start writing her own novel. But one day several years ago, a chance encounter with an extraordinary child in front of an ice cream store made R. J. realize that the pe R.J. Palacio lives in NYC with her husband, two sons, and two dogs. For more than twenty years, she was an art director and graphic designer, designing book jackets for other people while waiting for the perfect time in her life to start writing her own novel. But one day several years ago, a chance encounter with an extraordinary child in front of an ice cream store made R. J. realize that the perfect time to write that novel had finally come. Wonder is her first novel. She did not design the cover, but she sure does love it.